I used to dress very literally for the 4th of July. As a proud American, of course it's one of my favorite holidays. I usually do it up wearing red, white, and blue to show my patriotism, but this year I have decided to go the all-American route and choose an outfit that's more classic, and less costume. This outfit sort of reminds me of a Tommy Hilfiger ad I once saw when I was in high school, minus the model's sandy blonde hair and piercing blue eyes. 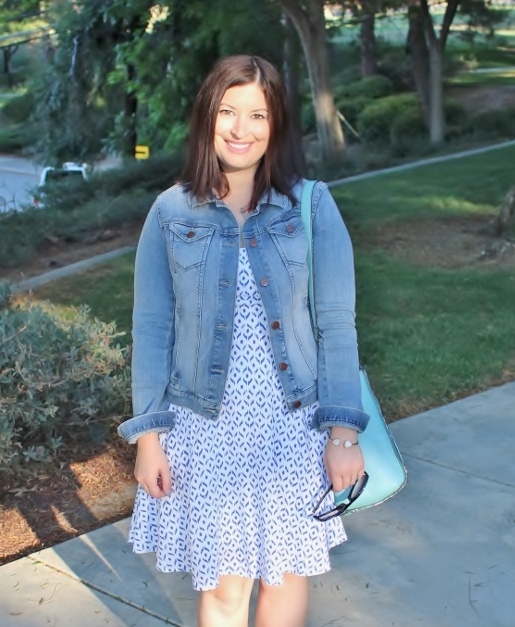 What's more American than a denim jacket and an easy little sundress? I've worn this exact combination three times now, and I love its simplicity. I never understood the whole "throw your jacket over your shoulders so it looks like you aren't trying too hard to be cool" thing, but I actually really like it (although I wouldn't say it's the most practical at times). This blue jean baby is definitely getting put to use! I hope you all have a wonderful, safe, and happy 4th! We don't have any plans this weekend, but I'm hoping it involves a grilled burger and a cold beer. Since I'm taking the rest of the week off from blogging, I'll see you all back here on Monday. This dress is such a cute print, love it on you! 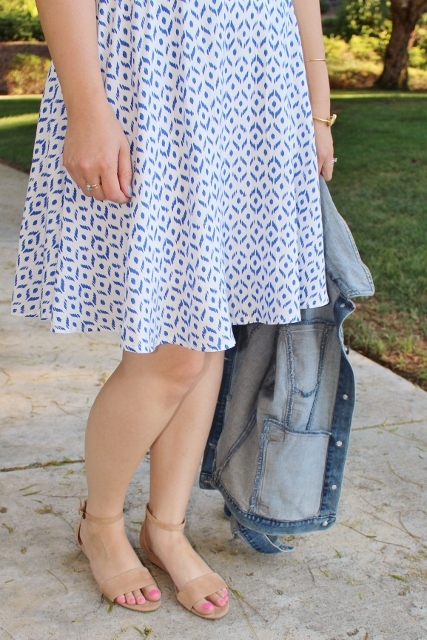 This outfit is definitely very Americana! And I do think the denim jacket looks cute thrown over the shoulders...I can see that making sense if you know it's going to be on/off frequently. (or...if you're like me and sometimes don't want to fuss with taking off your bracelets so you can get your jacket on!! ha ha) Hope you enjoy your low-key holiday! So cute! I love the bag and jewels. Hope you have a wonderful 4th! Thank you ladies! And gentleman :) Have a wonderful long weekend! July is such a fun month, enjoy it! I LOVE this as a 4th of July outfit! And now I have Tom Petty in my head... hoping you have an amazing holiday! have a nice weekend and that dress is so darling on you. Again I would totally wear that. 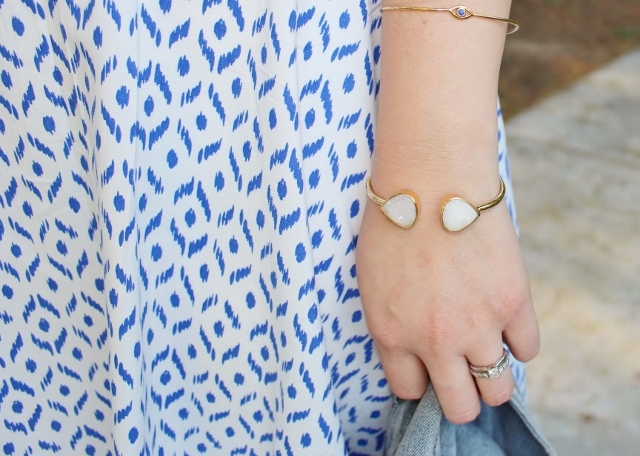 Blue and white and simpler ways are my favorite. Plus that dress has a great print - Old Navy is always full of surprises. I totally agree on the more classic, less costume route. I have a similar outfit post planned for tomorrow. You always look classic and beautiful though. I love your dress! Enjoy your weekend. awesome outfit that's cute for the 4th. I love it. very classic and classy. happy 4th! Lovely dress, beautiful outfit. You look pretty amazing as always. Love your style. Wish you a great friday and enjoy it tomorrow.